As an OS/2 user, I have limited choices when I want to use a laptop with Wifi. Life got better when I bought a Travel Router. A Travel router can be connected to the Ethernet port of my laptop and provide a good WiFi connection even if my laptop has only support for the Ethernet port. The idea is to connect the Ethernet port of the laptop to the travel router. Depending on the type of travel router, power can come from the wall or it can come from a USB port of the laptop. 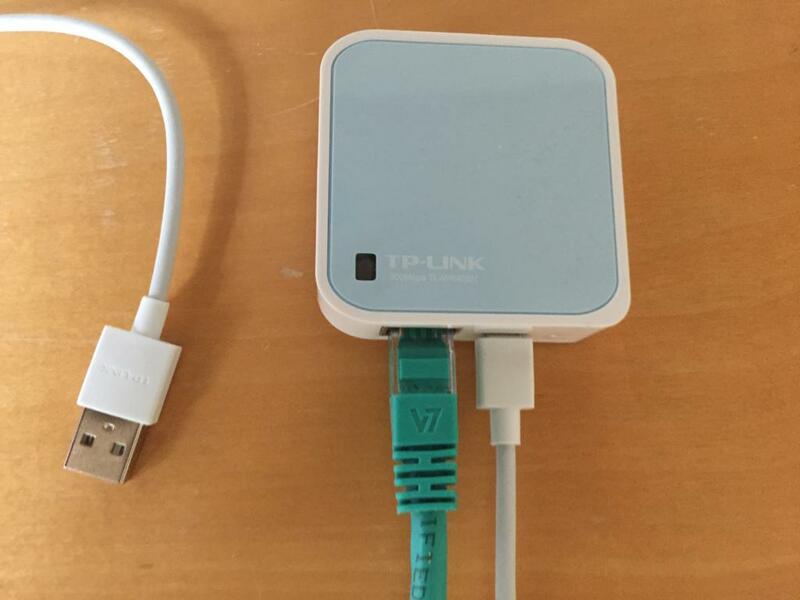 When you want to use your laptop in WiFi, connect the Travel Router to power and Ethernet between the router and the laptop. power them both and wait for the light on the Travel router to show that it is ready. Four routers are presented here, an Asus RP-N12 that plugs into the wall, a TP-Link Nano Router, a TP-Link AC750 and a VIXMINI that plug into a USB port for power. If any of the USB-powered routers are plugged into the USB port of the laptop, then it can run from laptop battery power. This will reduce the time available on battery power. The easiest way to use WiFi is to let the computer get an IP address automatically. This is the default setting in OS/2, and it can easily be set by the TCP/IP configuration in the Setup folder (Local System->System Setup->Network->TCP/IP->TCP/IP configuration). For simplicity, I'll describe the configuration of the router assuming the computer will get an address automatically. When the Travel router shows ready, open the web browser to the table listed below. This will bring up the travel router administration logon prompt. If it does not, the travel router wasn't ready or the laptop didn't get an IP address. Reboot to give it another chance. Only the TP-Link screens are shown, but the screens for the Asus are very similar. The TP-Link AC750 screens are also very similar. The VIXMINI screens are completely different. Further, the VIXMINI is running dd-wrt, so that set of screens are available as well. Log on to the router using the username and password listed above. 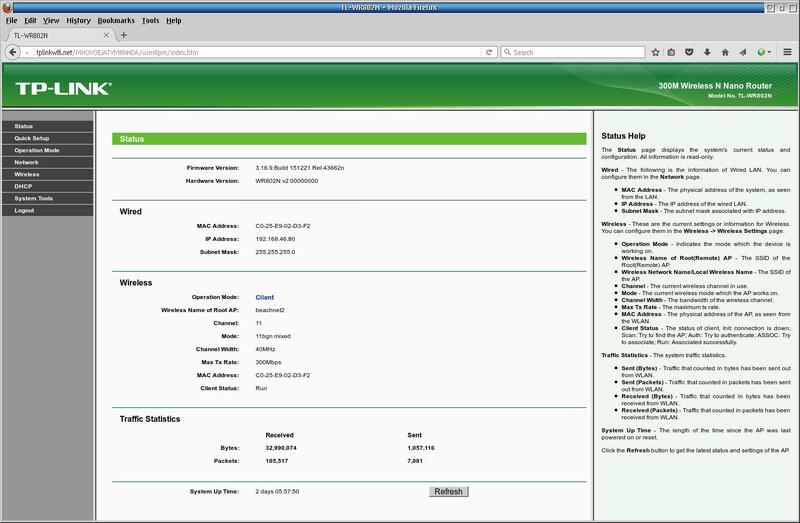 Once you are logged it, the router will display a status screen. The screens are listed below. On the Status screen of either Travel Router, select quick setup. You want to configure as a client. That should lead you to a screen where you select among the available WiFi access points. You will be prompted for a password if one is required. The router will ask to reboot. 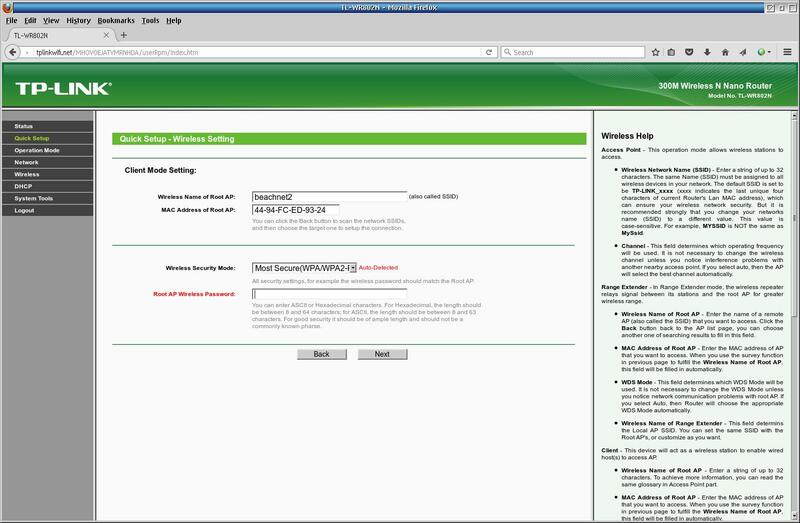 You will also need to reboot the laptop (or release/request a new IP address if you know how) to get your new IP address. At this point you should be connnected to the Internet and to any services available on the local LAN. You can power both the laptop and the Travel router,and settings will be restored on your next powerup. You only need to repeat this procedure to use a new access point. The default userid is admin and password is admin. Logging in will bring up the Status Screen. To set up networking, choose Quick Setup in the upper left part of the screen. Press Next to start configuring WiFi. Choose Client on this screen. The other modes won't help for the task of bringing WiFi to our OS/2 laptop. After scanning for WiFi signal, a list of WiFi access points should appear. In my case, I pick beachnet2, which is the name I selected for my office router. Check the box for the router you want to use and press Next. My router demands a password, so I enter it here. If no password is required, this screen will not appear. I recommend using SmartIP, the default. This passes through the IP address given by the WiFi access point. For file sharing using SAMBA or for printing, this will help. This setting is less important for a public WiFi. WiFi is now configured. To use WiFi, you can reboot the laptop now, or simply wait for the DHCP settings to update to the new configuration. The WiFi settings will remain until you change them again. I have cut the WiFi Password out of the screenshot. Normally the password will appear on this screen just as you entered it. The router is ready to use. The VIXMINI is smaller, lighter and cheaper than the other routers. It is also far more capable. 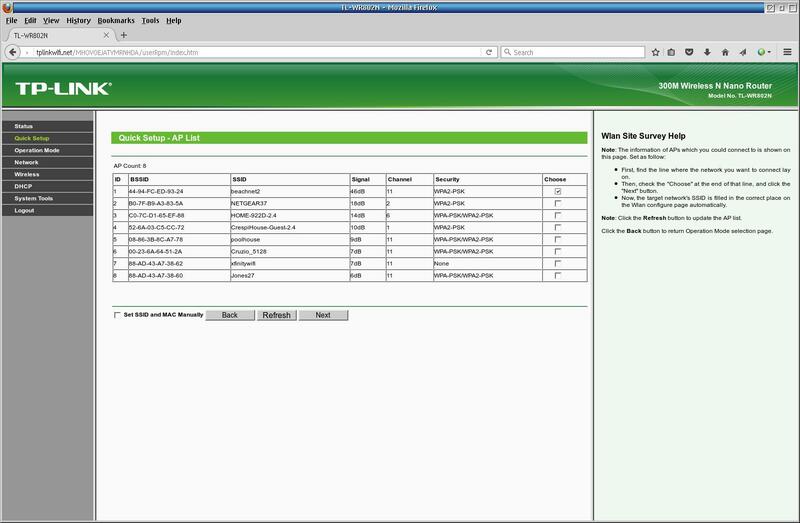 The open-source GL-iNet runs on top of dd-wrt. Menus for both systems are available The flexibility allows power users to do almost anything with this device.